On Wednesday, the Seasoned Bandit entered the Coast Hills branch on Bradley Road, showed a note to the teller that demanded money and said he had a gun. The teller then handed him an undisclosed amount of cash. 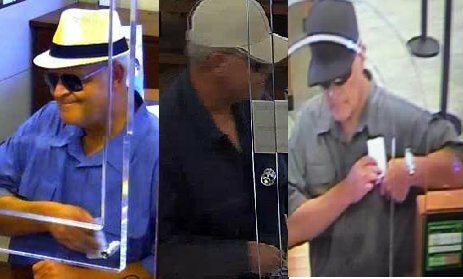 Federal investigators say they are seeking the Seasoned Bandit for at least nine bank robberies that have occurred since April 2017. Authorities describe the robber as a white male in his 50s or 60s. During the robberies, the Seasoned Bandit dressed in casual clothing, a hat and sunglasses. He passed notes to the tellers demanding cash and threatening them with a gun. Coast Hills Credit Union in Santa Maria on Sept. 6. Authorities request that anyone who has information about the Seasoned Bandit’s identity or whereabouts contact law enforcement. Informants can reach the FBI in Los Angeles 24 hours a day at (310) 477-6565. About three years ago I photographed a sign on the front door of a bank in Holland, Michigan that said “please remove your hat and sunglasses before entering this bank”. Today I’m surprised the police don’t unmask or arrest masked protesters in towns. With today’s technology, how is it possible that the banks have such low resolution cameras? I really want to know!